It's a New Year. Let’s Get Moving. 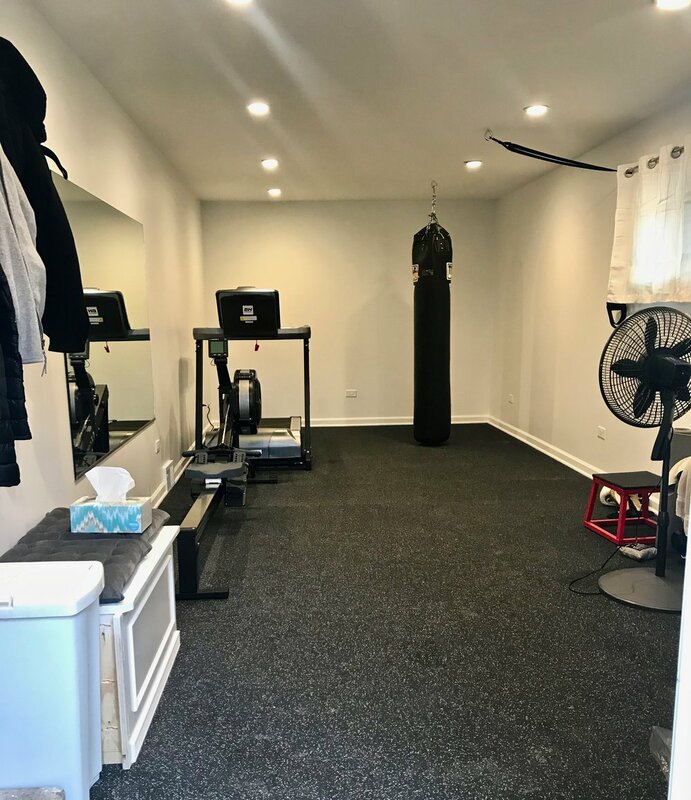 A client referred us to new homeowners in Evanston who had a healthy goal in mind: to create an enclosed gym from a car port-turned-garage. This project did not neatly fit our typical engagements in size or type, but we were intrigued from the start. There is something about solving new problems that appeals to us. Retrofitting a space built for one purpose into a new space for a different purpose presents the kind of challenges we like. Also, we like to lend a hand to our Northwestern peeps when we can. We’re glad the results exceeded our client’s expectations. The former garage comfortably holds a treadmill, rowing machine, heavy bag, TRX system, and more, all on a 3/4” thick rubberized floor. No more excuses for skipping a workout when you have this attached to your home. A view of the entry to the gym, with closed storage, new exterior door, new windows, and lockers. The clients can check their form in the 6’ x 4’ wall mirror, too. Heat is drawn from the main ductwork inside the home, and the walls are coated in a special scuff-resistant paint. The former garage started as a car port before it was enclosed by the previous owners. Our first task was to remove the rolling garage door, create an insulated sub-floor, and frame the walls and ceiling. A minimally functional garage often has limited electrical installed and no insulation. They are drafty with exposed framing and uncomfortable during the Winter with no heat supply. After running the new electrical, we insulated the sub-floor, walls, and ceiling with closed-cell spray foam to provide an air-tight insulation seal. We added lighting and electrical outlets to ensure the new space would function well as gym, and we also took steps to ensure that the gym could be returned to a garage in the future if new owners needed it. Under the 3/4” plywood sub-floor is a vapor barrier, stud platform, and closed cell foam insulation. A minor amount of disassembly and demolition would be required to revert to a functional garage in the future. We were delighted to help these new owners build the gym they envisioned and take advantage of an extra car spot they didn’t need. What used to be a basic garage is now a functional gym for owners who use it every day. We wish them and you a healthy and active 2019! Residential real estate descriptions are a hoot. Imagine the comedy if you could type MLS sentences into software like Google Translator and see what comes out. For example, “Lovely vintage home with lots of charm” actually means “Holy #&%! there’s a freakish amount of work to do here.” This description should trigger your fight-or-flight response. Our clients in Wilmette chose the former when they purchased a home built in 1900 described with exactly these words. 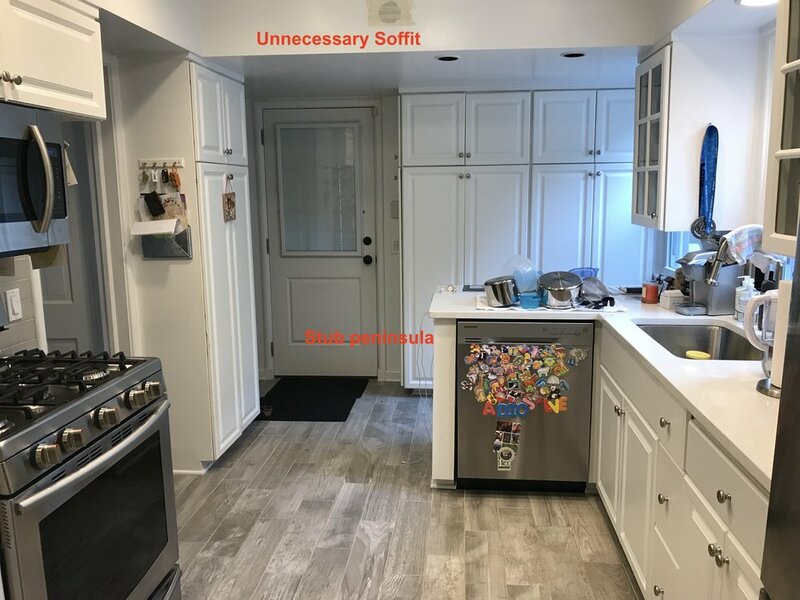 After completing major structural work (the alt-meaning of “lovely and vintage home with lots of charm”), they contacted us for a two-story addition. Not only was this family of four undaunted by the scope of the project, they decided to ride out the construction by living in the front of the house while we ripped off the back and rebuilt it during the cold part of the year. Tough characters, we said. As part of the addition, we installed a modern new kitchen with an oversized window overlooking the backyard. A view of the finished kitchen with cypress-colored lower cabinetry paired with the gloss sheen white upper cabinets. A clean slate for a kitchen is one of those sweet moments on a construction site. For us, at least. Our first step was to remove the old kitchen, including donating the old cabinets to the Evanston ReBuilding Warehouse. Deconstructing the back of the house in preparation for the heavy equipment. Let me introduce you to my little friend. We think our clients would approve of this message after living though a major renovation project. We’ll return to this project in a future blog entry. In the meantime, we’ve been wrapping up a few kitchen projects that we’ll cover in the Kitchen Series. Our brave clients not only survived the construction while living through it, they appear to be thriving. We’re glad we had the opportunity to improve this old home, and we wish them many happy years in it. Until next time . . . Happy Thanksgiving to all.